Cannon, a heavy implement used to set projectiles in motion by means of the explosion of gunpowder. Its general form is that of a tube closed at one end. The term is applied to all heavy firearms which are discharged from carriages, in contradistinction to small arms which are discharged from the hand or shoulder. The introduction of cannon followed the invention of gunpowder. The first used were conical, and resembled an apothecary's mortar internally and externally. They were called mortars, bombards, and vases; they were fired at high angles, and in consequence of the slow combustion of the gunpowder of that day, the stone missiles which they threw moved with little velocity. (See Aetilleey.) To economize the action of the powder, and to give greater accuracy to the fire, the bore was afterward made nearly cylindrical, and from four to eight calibres long, terminating at the bottom in a very narrow and deep chamber, the object of which was to increase the effect of the powder by retarding the escape of the gas. These cannon were further improved by making the bores perfectly cylindrical, and were called perrieres, from the fact that they fired stone balls. The first bombards were made of bars of iron bound together by hoops; they were afterward made of wrought iron, and finally of cast metals, bronze, iron, and steel. Bronze cannon were used in the time of John the Good of France (1350-'64). Cannon loaded at the breech were among the earliest forms introduced, but they were abandoned for want of strength in the mechanism. The introduction of cast-iron projectiles led to the invention of a new kind of cannon called culverins, the shape and appearance of which were very similar to those of the guns now in use. The great strength of these cannon and their projectiles permitted the use of larger charges of gunpowder, and marked an important step in the improvement of artillery. The idea prevailed among ancient artillerists that the range increased with the length of the piece, and consequently many culverins of enormous length were cast. A remarkable piece of this kind, familiarly known as "Queen Anne's pocket piece," is still to be seen at Dover, England. It is 25 ft. long, and carries a ball weighing only 25 lbs. In 1478 an attempt was made to use mortars for throwing hollow projectiles filled with powder, to which was attached a burning match for the purpose of setting the powder on lire; but this practice was abandoned for a time, owing to the rudeness of the methods, and the frequency of accidents resulting therefrom. Means were however devised in 1634 for overcoming the difficulties which had been encountered, and for perfecting the manufacture and use of mortars. They are now in use throughout the world, and owing to the great improvements which have been made in constructing armored ships and fortifications, so as to render them proof against direct fire, mortars and mortar or vertical firing are attracting special attention from artillerists and engineers. In the time of Louis XIV. a great variety of mortars were used, some of which, called Comminges after their inventor, threw projectiles weighing as much as 550 lbs. During our civil war, wooden mortars of the most primitive kind, made of logs bored or burnt out, and with very light charges at close range, were used effectually by the Union troops at Vicksburg, for throwing grenades and small shells into the enemy's lines. Thirteen-inch mortars of cast iron were used also in the siege of Fort Pulaski and the attack upon the forts below New Orleans, while those of a smaller calibre were used at the siege of Petersburg, under the direction of Gen. H. L. Abbott, in pursuance of an idea suggested by Maj. Gen. Bormann, of the Belgian service. He proposed to convert a 10-inch mortar shell into a spherical case shot, by filling it with balk and a bursting charge sufficient to rupture the shell, the fuse to be so timed as to explode the charge about 50 ft. from the ground. The expedient was of great effect, and will doubtless be imitated in future wars. A light kind of mortar, called Ooehorn after its inventor, and weighing about 160 lbs., mounted upon wooden blocks furnished with handles, designed to throw 24-pound shells, is also an effective gun for use against rifle pits or light breastworks, and is again becoming popular. Early attempts were made to throw hollow projectiles from per-rieres and culverins; but great difficulties were experienced in loading them, and the accidents which resulted caused the practice to be abandoned for a time. Subsequently, however, the effort was renewed, and, after the length of the piece was reduced so that the projectile could be placed in position by hand, became successful. These short cannon came rapidly into use, and, under the name of howitzers (Ger. Haubitzen), are now found in the artillery systems of all nations. - The calibre of a cannon is the diameter of its bore, given in inches, or in the' weight of the ball which it takes; but since the introduction of rifled cannon and elongated shot, the calibre of a gun is generally expressed in the measure used in giving the diameter of the bore. Each nation has its own system of calibres, and no two have the same. Changes are continually being made, and improvements are everywhere in progress. During the past 20 years many novelties have been introduced both in the construction and the use of cannon. In 1820 the heaviest gun mounted upon our seacoast was the 24-pdr. throwing a ball 5-82 inches in diameter. At present (1873) the heaviest is a cast-iron smooth-bored 20-inch gun, throwing a shell weighing 1,080 lbs., with a charge of powder varying from 100 to 200 lbs. - Cannon are classified according to their nature, uses, and peculiarities, as guns, howitzers, and mortars, or as field, mountain, prairie, siege, and seacoast cannon; or again, as rifled and smooth-bored cannon. The principal parts and nomenclature of cannon are shown in fig. 6. The interior of cannon may be divided into three distinct parts: the vent, or channel by which fire is communicated to the charge; the chamber, or seat of the charge; and the bore, or that part of the cylinder passed over by the projectile. The size of the vent should be as small as possible in order to diminish the escape of the gas, and the erosion of the metal which results from it; and experiment shows that the interior orifice of the vent should be placed at a distance from the bottom of the chamber equal to a quarter of its diameter, or at the junction of the sides of the chamber with the curve of the bottom. The form of the chamber, or seat of the charge, has an effect upon the force of the gunpowder, as well as upon the strength of the piece to re-'sist it; and experience has shown that its length should in general be equal to its diameter, and its surface should be as small as possible compared with its volume. The charges with which solid projectiles are fired being generally greater than one sixth of their weight, the cartridge occupies a space the length of which is greater than the diameter; the form of the seat of the charge is therefore simply the bore prolonged. This arrangement reduces the length of the charge so that its inflammation is as complete as possible before the projectile begins to move. To give additional strength to the breech, the bottom of the bore is generally rounded into an arc of a circle, but is sometimes hemispherical, tangent to the surface of the bore. All cannon of the newest models have the bottom of the bore finished as a semi-ellipsoid, this form being thought to give greater strength than the hemisphere. The following figures illustrate the various forms of chambers in use. In the earlier days of artillery, when mealed powder was habitually used, it was believed that the longest pieces gave the greatest range. In accordance with this idea, culverins were made of great length, and were only shortened after repeated experiments showing that the range increased at each reduction in length. The length of the hore has an important effect upon the velocity and range of the ball. This will be clearly seen by a consideration of the forces which accelerate and retard its movements. The accelerating force is due to the expansive effort of the burning powder, which is greatest when the grains are completely converted into gas, which in turn depends upon the size of the charge and the size and constitution of the grains. The retarding forces are the friction of the projectile against the sides of the bore, the shocks of the projectile striking against the sides of the bore, and the resistance offered by the column of air in front of the projectile. As the accelerating force of the charge increases up to a certain point, or till the combustion is completed, and rapidly diminishes as the space in rear of the projectile increases, and as the retarding forces are always opposed to its motion, it follows that there is a point where these forces would become equal, and the projectile move with its greatest velocity; it also follows that after the projectile passes this point its velocity decreases, until it is finally brought to a state of rest, which would be the case in a cannon of great length. Experiments made by Maj. Mordecai show that the velocity increases with the length of bore up to 25 calibres, but that the gain beyond 16 calibres gave an increase of only 1/18 to the effect of a 4-1 b. charge. Taking the calibre as the unit of measure, it has been found by experience that the length of bore is greater for small arms which fire leaden bullets than for guns which fire iron shot, and greater again for the latter than for howitzers and mortars which fire hollow projectiles. In the earlier days of artillery, when dust instead of grained powder was used, the weight of the charge was equal to that of the projectile; but it is now admitted that a charge of powder equal to one fourth of the weight of the projectile, and a bore of 18 calibres long, are the most favorable combination that can be made in smooth-bored cannon, to obtain the greatest range with the least strain upon the piece and its carriage. - The exterior form of a cannon depends upon the strength necessary to resist the varying pressure of the gas generated by the combustion of the gunpowder, and in general terms may be described as being largest at the seat of the charge, and gradually decreasing toward the muzzle, at or near which it is smallest. Various methods have been resorted to for determining the pressure of the gases throughout the bore, and deducing'therefrom the proper exterior form for the different kinds of cannon. The most successful of these is a modification of a plan first used by Col. Bomford about 1841, and subsequently improved by the late Gen. Rodman of the United States ordnance corps. It consists in boring a series of small holes through the sides of a cannon at right angles to its axis, at intervals of one calibre, and loading them with steel balls, which are projected by the force of the charge into a ballistic pendulum. The pressure at the various points is calculated from the velocity given to the balls. By this plan the form of the guns known as columbiads was determined. Gen. Rodman's modification consists in substituting for the bullets a steel punch which is pressed by the force of the gases into a piece of soft copper. The weight necessary to make an equal indentation by the same punch in the same copper is then obtained by machinery for each hole in the side of the gun, and a curve constructed by plotting the results thus obtained, as in the following diagram. 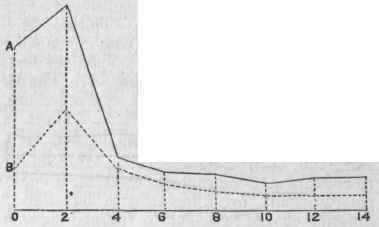 The ordinates of the curve A show the pressure on the bore at intervals of two calibres, commencing at the bottom of the bore, for grain powder; and those of the curve B show the same for cake powder. The latter produced only about one half the mean pressure on the length of the bore, and gave nearly the same velocity to the projectile. Cannon, in common with all other firearms, are subjected by usage to four classes of strains: tangential strains, which act to split the piece open longitudinally; longitudinal strains, which act to pull the piece apart in the direction of its axis; strains of compression, acting from the axis outward; and transverse strains, acting transversely, as it were, upon the staves of which the piece may be supposed to consist. A formula embodying these strains, the pressure of the gas, and all other elements entering into the question, was deduced by Gen. Rodman from a series of original experiments. Its solution for particular cases gives a series of curved lines, a specimen of which is seen in the following figure of a Rodman gun. The exterior of a cannon is divided into five principal parts: the breech, A; the first reenforce, B; the second reenforce, C; the chase, D; and the swell of the muzzle, E. The breech is the solid part of the piece in the prolongation of the axis; its length should be from one to one and a quarter time the diameter of the bore, H. The first reenforce extends from the base ring to the seat of the ball, and is the thickest part of the piece, for the reason that the pressure of the gas is found by experience and calculation to be the greatest before the ball has moved far from its place. The second reenforce is that portion of the piece to which the trunnions are attached, and extends from the first reenforce to the chase; it is made thicker than is necessary to resist the pressure of the gas, in order to serve as a proper support for the trunnions and to compensate for defects likely to appear in all castings of irregular shapes. The chase extends from the end of the second reenforce to the muzzle, or to the swell of the muzzle, which is now generally omitted from large cannon. Trunnions, F, are cylindrical arms attached to the sides of cannon for the purpose of supporting them upon their carriages, and permitting them to be elevated and depressed in action. On the supposition that the strain upon the trunnions is proportional to the weight of the charge, it is laid down as a rule that the diameter of a gun's trunnions should be equal to the diameter of its bore, and of a howitzer's equal to the diameter of its chamber. The axis of the trunnions is placed in the same plane with the axis of the piece in all the cannon of the United States service; and in this position the force of the charge is communicated to the trunnions directly, without producing any other than the inevitable strain on the carriage and without checking the recoil. Were the axis of the trunnions above or below that of the piece, the force of the discharge would act to turn the piece slightly upward or downward, producing unequal strains. In many cannon the axis of the trunnions passes also through the centre of gravity of the piece. This arrangement was introduced by Gen. Rodman, who has shown that cannon constructed in this way may be fired with accuracy, and, although easily moved, do not when fired sensibly change their position before the projectile leaves the bore. - The weight which a cannon should have depends upon the weight of the projectile it is to throw, the maximum velocity which it may be desired to give to it, and the extent of the recoil that can be permitted. The last being limited by the conditions of service, the weight of the piece may be deduced from the principle that the quantity of motion expended on the piece, carriage, and friction is equal to that expended on the projectile and the air set in motion by the charge. A "gun," technically speaking, is a heavy cannon, intended to throw solid shot with large charges of powder, for the purpose of attaining great accuracy, range, and penetration; it is distinguished from other cannon by its great weight and length, and by the absence of a chamber. It is suitable for firing shell and solid shot. The system of Gen. Paix-hans consists in the employment of shells in heavy cannon, and not in any special form of the gun itself. The howitzer, alluded to before, is a cannon employed to throw large projectiles with small charges of powder; it is shorter, lighter, and more nearly cylindrical in shape than a gun of the same calibre, and has a chamber for the reception of the charge. The principal advantage of a howitzer over a gun is that it weighs less, and can produce at short range a greater effect with hollow projectiles and case shot. A mortar is a still shorter cannon than a howitzer, and is employed to throw hollow projectiles at greater angles of elevation, so as to produce effect by the force and direction with which they descend upon their object. Oolumbiads are a kind of cannon for seacoast purposes, which combine certain qualities of the gun, howitzer, and mortar. They are long chambered pieces, capable of projecting shells and solid shot with heavy charges of powder, at high angles of elevation, and are therefore equally suited for the defence of narrow channels and distant anchorages. They were invented by Col. Bomford, an American officer, and were first used in 1812, previous to Gen. Paixhans's adoption of the same idea. The different kinds of cannon are made of various sizes and classifications according to their use, and are adapted to seacoast defence, siege, and garrison purposes. Field cannon are used in the operations of armies in the field, and are divided into light and heavy pieces; the former following the rapid movements of infantry and cavalry, and the latter designed to commence action at long distances, and to defend fortifications and other important positions on the field of battle. Formerly light field pieces were 6-pdr. guns and 12-pdr. howitzers; and the heavy pieces were the 12-pdr. gun and 24 and 32-pdr. howitzers. But at the outbreak of the late war in this country, the heavy pieces were discarded, or used for arming field works and blockhouses, and their places were supplied by the light 12-pdr. smooth-bore guns and the 3-inch .rifled guns. These rifle guns are made of wrought iron, by wrapping boiler plate around a mandril so as to form a cylindrical mass, which is firmly and solidly welded by bringing it to a white heat and passing it between rollers. The trunnions are afterward welded on, and the piece bored and turned to the proper shape. The 3-pdr. Parrott rifle gun, which is also employed in the United States, is a cast-iron piece, reenforced by a band of wrought iron shrunk upon the first reenforce. Before the general introduction of rifle guns the Napoleon gun, taking its name from the late emperor of the French, was adopted by nearly all nations. It was designed to take the place of both light and heavy pieces, and thus simplify field artillery. Its exterior is characterized by the absence of mouldings and ornament; it has no chamber, and its weight is 1,200 lbs., or 100 times the weight of the projectile. Mountain and prairie cannon are designed for use in regions destitute of roads, and must therefore be made sufficiently light to be carried on pack animals. They are not very effective, and are only used when nothing heavier can be brought up in time. - Rifle cannon are of various sizes and patterns, and are constructed with spiral grooves, or rifles, cut into the surfaces of the bore; the purpose of which is to communicate a rotary motion to oblong projectiles, without which they would turn over during their flight, and present a varying surface to the air. This rotary motion, if effectively communicated to the projectile, keeps its point constantly in the direction of its flight, and gives it increased range and steadiness, and also increased accuracy. Great attention has been given to the method of rifling cannons with the object of securing the surest and safest means of causing the projectile to follow the grooves, as it passes along the bore of the piece, under the action of the powder. A great variety of methods have been devised, but they may be classed under the following heads: by means of flanges upon the projectile, or by giving it a peculiar shape by causing some part of it to expand, or by causing some part to be compressed. Solid flanges projecting from the projectile, and so shaped as to fit the rifling of the bore, were the first means used; but as these projections were of the same hard and unyielding substance as the body of the projectile, they frequently led to the bursting of the piece. Buttons of zinc, copper, or bronze were afterward adopted by nearly all European powers. Whitworth and Lancaster adopted the idea of making cannon with the bore cut in a spiral form, having a polygon or curve for its base, and giving the projectile a corresponding shape. This method secures the rifle motion with much certainty, and permits the use of bolt-like projectiles of great strength, but which bring heavy strains upon the cannon, accompanied by a corresponding tendency to deterioration of the piece. Projectiles which take the rifles by expansion are composed of cast iron, with a cup, band, or other arrangement of soft metal at the base, which is expanded and forced into the grooves by the explosion of the charge. Projectiles of this class are generally used in the United States service, because they are easily forced to the bottom of the bore, and do not clog the grooves or overstrain the piece. There are many varieties of this class, the most noted of which were invented by Parrott, Hotchkiss, Schenkle, and Dyer. Expanding projectiles cannot be fired with such heavy charges as some others, for fear of breaking, nor are they so sure to receive the rifle motion. Projectiles which take the rifles by compression are principally used in breech-loading cannon. They are generally covered with soft metal, so as to be slightly larger than the bore of the piece, but still not too large to enter the chamber easily. The explosion of the charge sets the projectile in motion, compressing the soft metal into the grooves, and compelling the projectile to follow the direction of the rifling. The form of a rifle groove is determined by the angle which a tangent to any point of it makes with the corresponding element of the bore. If the angles be equal at all points, the groove is said to be uniform; if they increase from the breech to the muzzle, the grooves are called increasing; and if the reverse, decreasing. Grooves are cut by moving a rod armed with a cutter backward and forward in the bore, and giving it a rotary motion at the same time. The width of a groove depends upon the diameter of the bore and the peculiar form of projectile to be used. Rifled cannon for flanged projectiles generally have four grooves, while those for expanding projectiles generally have an odd number, from five upward. - The processes used in manufacturing cast-iron or bronze cannon are moulding, casting, cooling, and finishing. Moulding consists in forming a cavity of the proper shape in moulding sand, by using wooden or cast-iron patterns, slightly larger than the finished piece is to be. The pattern is divided into several pieces; the first consists of the body of the piece, from the base ring to the chase ring; the second, of the swell of the muzzle and the sprue or dead head; the third, of the breech; the fourth and fifth, of the trunnions. The sprue, or head, is an additional length given to the piece for the purpose of receiving the scoria of the metal as it rises to the surface, and furnishing the extra metal to provide for shrinkage, and extra weight to increase the density of the lower portions of the piece. The best material for the mould is dry, hard, refractory sand, which must be moistened with clay water to make it adhesive. The mould is formed in a casing of cast iron, called a box or flask. The pattern for the sprue and muzzle, previously coated with pulverized charcoal or coke, moistened with clay water to prevent adhesion, is placed upon the ground, the muzzle part up, carefully surrounded by the corresponding part of the jacket, and when properly adjusted the sand is rammed about it. The model for the body of the piece is then placed on top of this, and the corresponding parts of the jacket adjusted and filled as before. The patterns for the trunnions,- rimbases, and cascable are affixed and filled in a similar manner, and the mould completed. Care is taken to cover each portion of the model with coke wash, and to sprinkle dry sand upon the top of each section of the mould, to prevent adhesion when they are separated. In the body of the sand within the flask a channel is formed, in the same manner as the cavity of the mould, for the purpose of permitting the molten metal to be introduced at the bottom of the mould, so as to prevent its injury by falling metal. If any portion of the mould is injured by withdrawing the pattern, it is repaired, and the interior of the mould then covered with coke wash, after which the several parts are placed in an oven and gradually dried. When this is finished, the parts are carried to a pit, reunited, and secured in a vertical position, breech downward. Pains are then taken to see that all parts of the mould are perfect and properly adjusted; the melted metal is permitted to flow in at the bottom of the channel made for that purpose, and as it rises in the mould a workman agitates it with a long wooden pole, taking care that the scoria and other impurities are prevented from getting into the cavities for the trunnions. After the mould is filled, it is permitted to stand from three to twenty days imbedded in sand, so as to cool gradually. When nearly cold the gun is hoisted from the pit, taken out of the flask, and cleaned of the sand. All solid bodies contract in cooling. If they cool unequally they will also contract unequally, and thus undergo a change of form, unless restrained by the presence of a superior force. The general form of a gun casting is that of a solid frustum of a cone; and in cooling from the exterior, the thin outer layer contracts first, and forces the hotter and more yielding metal within toward the centre of the mould. The next layer cools, and tends to contract; but the exterior to which it coheres has become nearly rigid, and does not fully yield to the contraction of the inner layer. The result is that the cohesion of the particles of the inner layer is diminished by a force of extension, while that of the outer layer is increased by a force of compression. As the cooling continues, this operation is repeated till the whole mass is brought to a uniform temperature. All cannon, therefore, that are cooled from the exterior, are subjected to two straining forces: the outer portions to a strain of compression, and the inner portions to a strain of extension; and these forces exert themselves upon the different parts of the gun with intensities proportional to their distance from the neutral axis, which is composed of particles so situated as to be neither extended nor compressed by the cooling process. The effect of these strains may be so great as to crack the interior metal of cast-iron cannon while they are cooling. These considerations led Capt. (afterward Gen.) Rodman to invent the plan, now generally adopted, of cooling cannon from the interior, by passing a stream of water through a hollow core inserted in the centre of the mould cavity before casting, and surrounding the flask with a mass of burning coals to prevent the radiation of heat from the exterior. By the use of Rodman's method cast-iron guns of 20-inch calibre have been made, and found by experiment to withstand the vicissitudes of usage admirably. After the piece is cooled, it is fastened upon a rack and lathe, and the sprue head cut off. If cast solid, the boring is commenced by means of a piercer, which bores a small hole along the axis to the bottom of the chamber; this is followed by a second cutter called a reamer, which completes the bore to the chamber. The reamer is then removed, and its place supplied by the chamber cutter, which gives the proper form to that part of the bore. In pieces cast hollow, the piercer is not used. While the boring is taking place the outside of the piece is turned to the proper shape, except at the trunnions, which are turned down by another machine. The vent is bored while the gun is in the trunnion lathe. The time required to finish a cannon depends upon its size; a 10-inch columbiad requires six weeks, while a 20-inch Rodman requires from 12 to 18 weeks. - The manufacture of wrought-iron or steel cannon is much more complex and attended by much greater difficulties than that of cast-iron or bronze. This is due to the fact that no machinery has yet been devised for heating, handling, and forging masses of wrought iron or steel sufficiently large to construct the largest cannon without welding; and this/even when most skilfully done, is always more or less imperfect, and renders the piece liable to explosion. The term "built up" is frequently applied to all kinds of wrought cannon, in which the parts are formed separately and then united together. The object of this mode of manufacture is to secure guns of materials more elastic and durable than cast iron or bronze, or to correct the defects of one material by combining it with another of opposite quality. Among the earliest applications of this idea was the trial made to increase the hardness and therefore the endurance of bronze cannon by casting them around a core of steel which formed the surface of the bore. But built-up cannon are not necessarily composed of more than one kind of metal; some of the most noted are made of steel or wrought iron alone. In these cases the defects which usually accompany the working of large masses, such as crystalline structure, cracks, and false welds, are partially avoided by forming them in small masses, as rings and tubes of good quality and excellent workmanship, and then uniting them successively, either by welding, forcing, or shrinking one part over another, and in some instances by-screwing them together. The various plans of making built-up guns will be best illustrated by describing some of the most noted. Armstrong guns are of two kinds, breechloaders and muzzle-loaders. The former are made by welding together several wrought-iron tubes at their ends; each tube is from two to three feet long, and is formed by wrapping a square bar of iron around a mandrel and welding the edges together. The part in rear of the trunnions is strengthened by enveloping it with two additional thicknesses or tubes, the outer one of which is like the inner one, but the intermediate one is formed by bending an iron slab into the proper shape and welding its edges. The details of the breech and other parts are shown in fig. 10. The muzzle-loading Armstrong gun (fig. 11) is constructed as follows: The barrel is made of solid steel tempered in oil, by which its brittleness is decreased and tenacity increased; that part of the barrel at and in rear of the trunnions is enveloped by three layers of wrought-iron tubes, not welded together at the ends, but hooked to each other by shoulders and recesses. This operation is accomplished by expanding the end of a tube by heat and slipping it over the shoulder of another, upon which it contracts by cooling. The Armstrong gun is not liable to burst without previously showing considerable enlargement. It is stated that of 3,000 guns built on this system, not one has failed by explosion. They have been made as large as 13 1/2inch calibre, weighing over 50,000 lbs. The Whitworth guns are made of a substance called homogeneous iron, or a species of low steel said to be made by melting short bars of Swedish iron and adding a small quantity of carbonaceous matter, after which it is cast into ingots. Fig. 2. - Cylindrical Chamber. Fig. 3. - Conical Chamber. Fig. 4. - Spherical Chamber. Fig. 5. - Pressure by Calibres. Fig. 6. - Kodman Gun. Fig. 7. - Dahlgren Gun. Fig. 8. - Seacoast Gun. Fig. 9. - Parrott Rifle Gun. Fig. 10. - Breech-loading Armstrong Gun. Fig. 11. - Muzzle-loading Armstrong Gun. Fig. 12. - Whitworth Gun. The smaller Whitworth guns are forged solid; the larger ones are built up with shells or hoops, forced into each other by hydraulic pressure. For this purpose they are made with a slight taper. The ends of the hoops are joined by screw threads. The hoops are first cast hollow and then hammered out over a steel mandrel or rolled out in a machine like that used for forming wheel tires. These guns have been made of various sizes up to 7-inch calibre. The Blakely gun is made as follows: The inner tube or barrel is formed of low steel; the next tube consists of high steel, and is shrunk on the barrel with just sufficient tension to compensate for the difference of elasticity between the two. The outer jacket to which the trunnions are attached is of cast iron, and is put on with only the shrinkage attained by warming it over the fire. The steel tubes are cast hollow and hammered over steel mandrels by steam hammers, by which process they are elongated about 130 per cent., and the tenacity of the metal at the same time increased. They are made to throw 700-lb. projectiles, with a calibre of 12 inches, and weigh as much as 40,000 lbs. (See fig. 13.) Palliser and Parsons guns are made by boring out cast-iron guns of old patterns and inserting a new barrel of coiled wrought iron. (See fig. 14.) Krupp guns are made at Krupp's works at Essen, Prussia, of solid low cast steel, and have achieved a great celebrity, partly through their enormous size and partly through their great durability. The steel is formed in crucibles in the usual way, and is then cast into a large ingot constituting the mass of the gun. This ingot is wrought under powerful steam hammers, to give the requisite texture to the metal and proper form to the gun. In this way it is said that 20-inch muzzle-loading rifle cannon have been made, weighing over 120,000 lbs. The details of this manufacture are kept secret, but its success is probably due to the very heavy machinery employed, the skilful heating of the large masses to the centre without burning the outside, the presence of manganese in the iron from which the steel is made, and the great care with which all the operations are conducted. The Gatling gun is a machine gun composed of six barrels made to revolve around a central axis parallel to their bore by means of a hand crank. As each barrel comes opposite to a certain point a self-loaded metal-cased cartridge falling from a hopper is pushed into the breech by a plunger, and held there till it is exploded by a tiring pin. This gun is capable of liring 200 shots per minute, with great range and precisiom. Che mitrailleuse of the French is essentially the same machine. (See Artillery). Fig. 13. - Blakely Gun. Fig. 14. - Palliser Gun. Cannon, a central county of Tennessee, drained by Stone's river and the Caney fork of Cumberland river; area, 220 sq. m.; pop. in 1870, 10,502, of whom 927 were colored. The surface is uneven and the soil generally fertile. The chief productions in 1870 were 79,520 bushels of wheat, 564,330 of Indian corn, 26,-870 of oats, 105,055 lbs. of butter, 21,451 of wool, 30,750 of tobacco, 54 bales of cotton, and 160 hhds. of sugar. There were 3,360 horses, 1,202 mules and asses, 2,487 milch cows, 4,068 other cattle, 12,198 sheep, and 23,550 swine. Capital, Woodbury.